I got asked the question a couple of days ago: "How did you start playing Kubb?". Swedes play Kubb at barbecues and at the beach in the way that Americans throw horseshoes or frisbees or the way that Brits play badminton. To Swedes, Kubb is just part of normal life, and in Sweden you can buy Kubb at every petrol station in the summer, to be picked up as you drive to your lakeside retreat. In your Volvo. However, to the rest of the world (with the possible exception of Eau Claire, Wisconsin) Kubb is highly niche, and most people will have been introduced to it by a friend, or will have happened across it being played somewhere. That latter method was how I came across the game. A couple of years ago, we were staying at a holiday villa in Talland Bay in Cornwall. I was taking the dog for a walk round the site one afternoon when I spotted a blond-haired guy playing a weird wooden skittles type game with his two young kids. I watched for a minute, and decided I'd ask about the game on the next lap of the site. By the time I got back, the (possibly Swedish) family had gone, and actually left the site permanently before I ever got a chance to ask. Carpe diem, folks. Anyway, google was my friend, as ever, and by searching for images related to "wooden skittle type game", I quickly found the name I was looking for. A few minutes later and I had ordered a very ordinary Kubb set to be delivered to us on site, with the idea that we would learn the game during the second week of our holiday. We played pretty much every day once we had our hands on the kit, and everywhere we went we were asked about Kubb. That is one of my clearest comments on Kubb: people are fascinated by it, and everywhere we play, before long, someone will ask what we are up to. In fact, if you like the game and are looking for people to play, I'd genuinely suggest that you just go to the local park and start playing a game. You'll have people asking to join in before you know it. 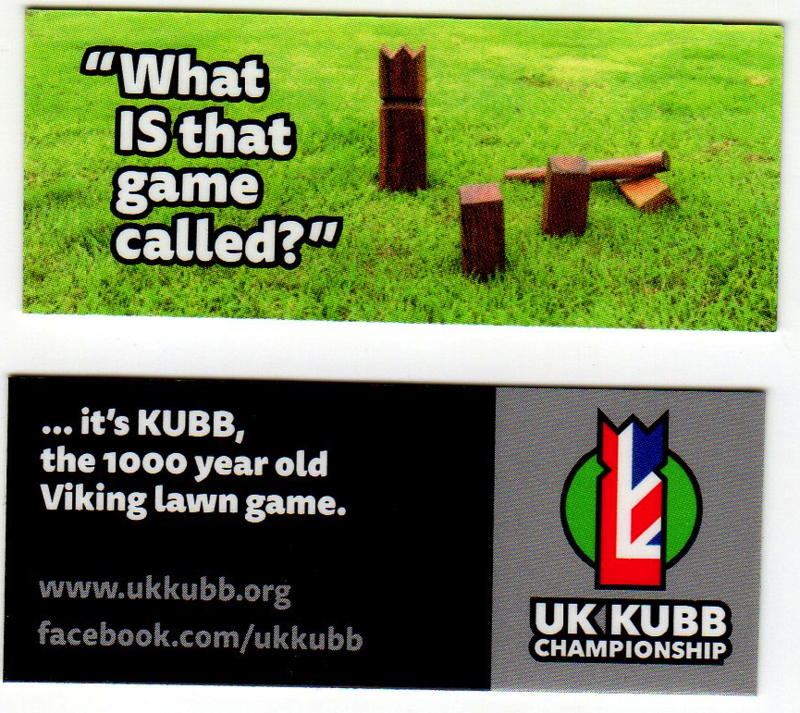 Once we got involved in the UK Kubb Championship, my friend Glenn had some little cards made up, so that when people asked about the game, we could send them away with a pointer to the web site. They work really well. Since then, we must have introduced another twenty or thirty people to the game directly, even without the UK Kubb connection, and most of my friends now have sets of their own. There's just something about Kubb that seems to be appealing and I am delighted to be involved in the ever accelerating spread of this fantastic game. A game that I was so lucky to stumble upon on a cliffside in Cornwall. Newer PostLong live the King!